Puglia offers so much diversity that one of the best ways to experience it, is by car, which is what Julian and I did. And when in Italy, one’s car of choice must be a zippy Fiat 500. We started our trip in Lecce, around a forty minute drive from Brindisi Airport. It’s a beautiful city of local soft creamy limestone and splendid Baroque architecture with a sense of crumbling decadence. One of the joys is walking aimlessly through its narrow cobbled streets to see what surprises you might find around the corner: a stunning Duomo, a pretty piazza with the ruins of a roman amphitheatre or cool little café where you can sit with an almond milk cappuccino watching local life unfold. 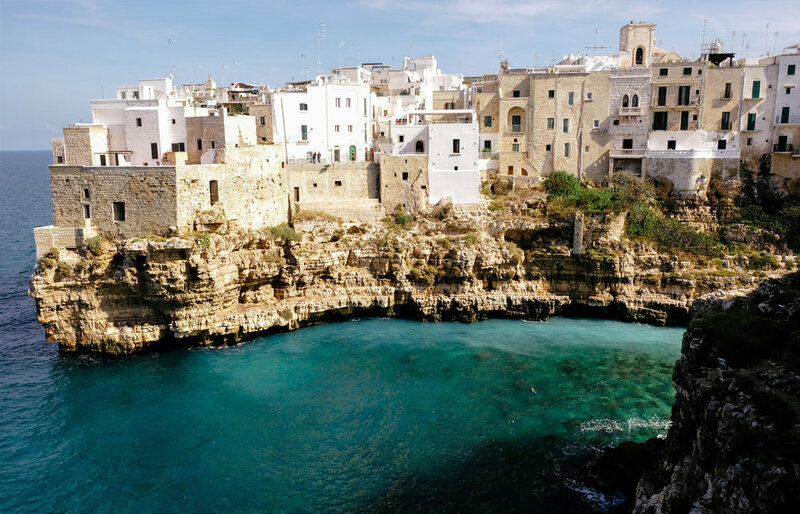 Lecce is the main town in Puglia’s Salento peninsula, a craggy coastline peppered with sandy beaches where two seas meet. One day we ate the freshest of fish for lunch overlooking the Adriatic Sea and then enjoyed an Aperol Spritz in the fortified island town of Gallipoli, as the sun set over the Ionian Sea. Puglia is one of Italy’s poorest regions and most people still live off the land. But this, together with a great climate and fertile soil, means the food is fantastic, abundant with local produce. You can taste the grassiest of olive oils and devour the famous ear shaped orecchiette pasta, which is best served simple with turnip tops and fried bread crumbs. Whilst a trip to a local cheesemonger will teach you how the milky mozzarella is made. Every meal comes with a chance to try some of the fabulous wines of the region. Red, white or rosé, it’s all delicious. 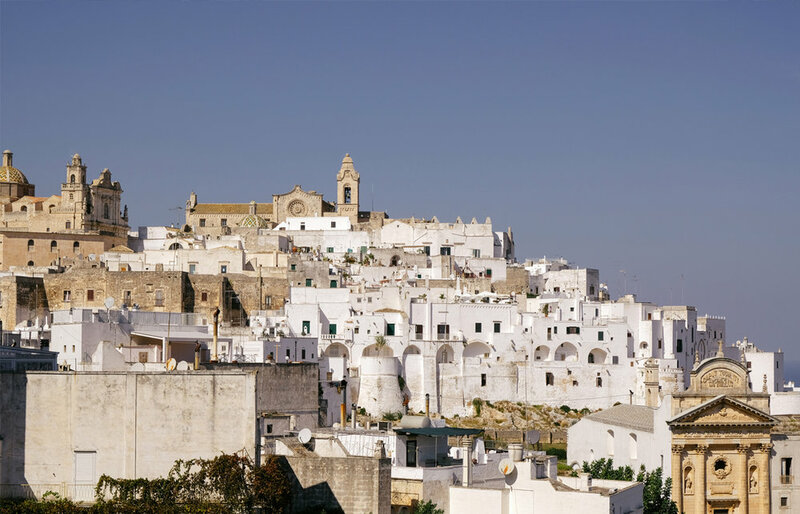 Moving from the south to the north we stopped in Ostuni where, rising up above the vast olive-carpeted plateau, clusters of white-washed houses wind around the hillside and are topped with a magnificent Gothic cathedral. We got lost wandering through Ostuni’s narrow back streets with their endless flights of steps and wonderful views. Not being able to help ourselves, we strayed a bit just over the border from Puglia in to Basilicata, where medieval Matera was unmissable for its overwhelming beauty. A World Heritage Site, its ancient cave districts, Sasso Barisano and Sasso Caveoso, date back to the Palaeolithic age and were inhabited by cave dwellers right up until the 1950s. 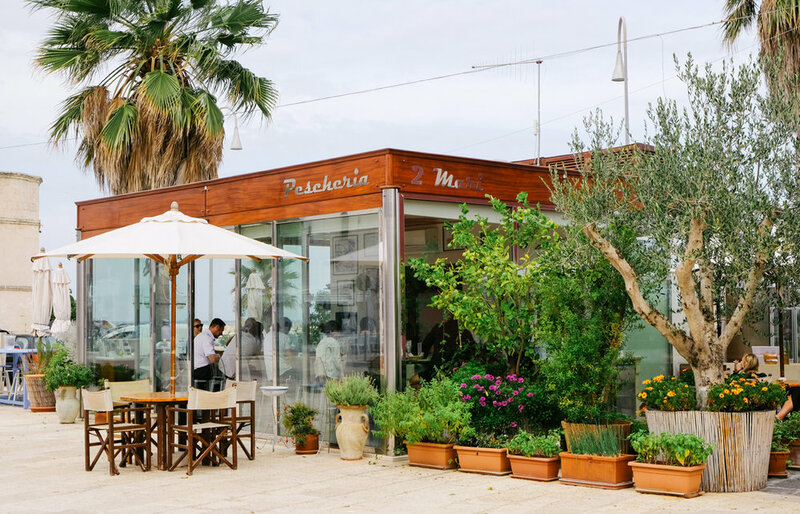 The best way to appreciate the city’s labyrinthine layout is on foot, maybe even having lunch in one of the caves which now house cool cafés and fine dining restaurants. Matera also boasts a superb artistic and cultural heritage and it will become the European Capital of Culture in 2019. Deciding not to spend the night in a cave complex restored into a hotel, we instead opted for a beautifully restored 19th Century palazzo adorned with beautiful tiled floors and stunning frescoed walls and ceilings. We headed back into Puglia, through the Valle D’Iteria, where the conical roofs of truilli houses are scattered as far as the eye can see. For the final few nights of our trip we stayed in one of the many Masseria - impressive constructions that were once the beating heart of local farming, which have now been turned into stylish hotels. Our days were spent cycling through olive groves, down to the local fishing village or to the beach. 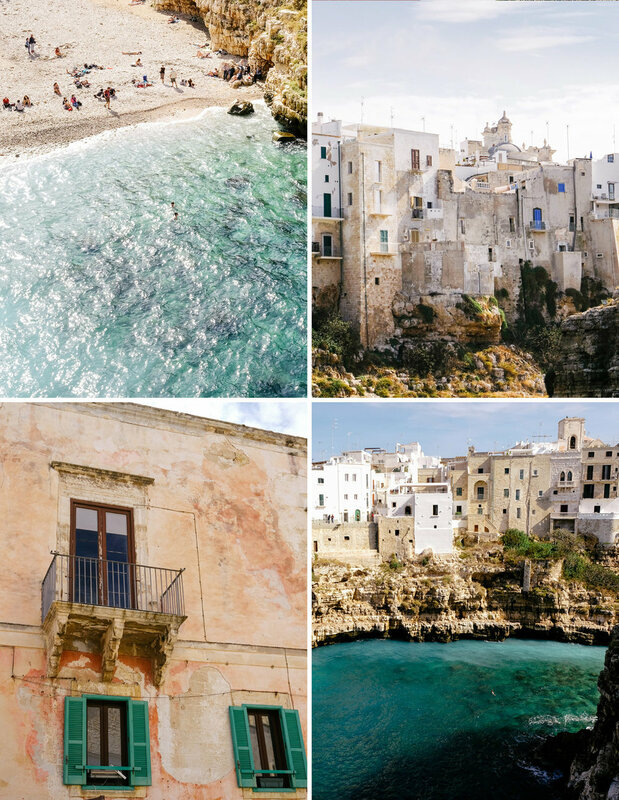 A favourite lunch spot was Polignano a Mare with its charming old town and most photogenic location lapped by a sea of many blues from azure to sparkling emerald green. 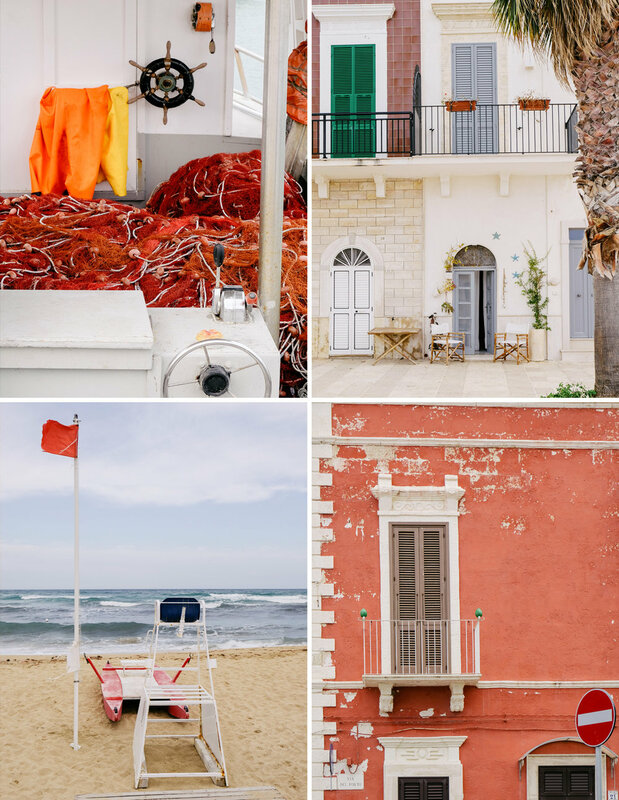 Puglia was a week of many experiences. But the best thing about it was the sense of freedom we had to explore in our little car. Taking each day as it came and planning the night before what we were going to do. But each day knowing we would be discovering something new and amazing, accompanied by the most delicious food and wine. Some would say, the perfect holiday! If you are interested in more information on a trip to Puglia or would like some further inspiration for your next holiday, please do get in touch.